The Liszt bicentennial is well served elsewhere. But a brief heads up for a body of work that happens to be my favourite Liszt and which has been strangely neglected in the birthday junketing. The complete edition of Liszt's transcriptions of Beethoven's Symphonies dates from 1865 and is dedicated to Hans von Bülow. Transcription is technially the wrong term as Liszt summarises and embellishes Beethoven with the aim of recreating for piano the spirit and not the notes of the symphonies. Writing of his transcriptions Liszt said "they ought more properly be called dérangements" - which takes us down an interesting semantic path. Most readers will have made the literal jump, as I did, from dérangement to 'de-arrange', making Liszt a very early deconstructionist. But, quite deliciously, my Oxford French/English dictionary offers the following translations of dérangement - 'bother, disorder, upset'. 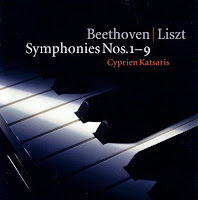 Fortunately you can decide for yourself whether Liszt transcribed, de-arranged or upset Beethoven as there is a first rate recording by Cyprien Katsaris, seen above, of the arrangements which is available as a budget priced Teldec 6 CD set and download. There is a further twist in this semantic path as Katsaris himself de-arranges/upsets Liszt's transcription/de-arrangement/upset of Beethoven's Sixth Symphony with some textual enhancements. Katsaris is a persuasive advocate of Liszt's arrangements which, for me, reach their peak in the sparse beauty of the adagio third movement of the Ninth Symphony. It is difficult to know why Cyprien Katsaris' fresh look at some of the greatest music in the classical canon is not better known, although the 'smooth classics' artwork seen below does not help, which is why I led with an artist shot. 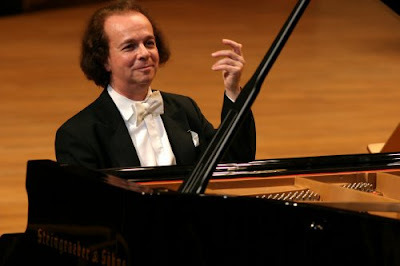 Now read about Marino Formenti's dérangement of Kurtág. "Dérangé" in French means "disturbed." Arrange is "arranger," and he was simply substituting a different prefix to make a bit of a pun; I don't think it should be taken seriously as if he were a deconstructionist. "Liszt disturbs Beethoven" - that is equally delicious. And please rest assured that any reference on the Overgrown Path to deconstructionists is a joke. By the way, if you have the Shelley set, another body of "transcriptions" that is delightful is the Schubert lieder. There are more than 11 hours of them, with a total of 128 songs. It's interesting to see how Liszt took the vocal parts and added them to what is, often, complex piano parts. The Shelley set is available by download from Hyperion at quite a nice price. While I haven't listened to all of it, it is full of gems that aren't among the most popular Liszt works. I should actually even go further with the meaning of "derangé." The verb deranger means to bother/disturb someone, but if you use it as an adjective - derangé - it means a person who is disturbed, as in crazy. So, Liszt disturbs Beethoven is nice, as long as you take into account the multiple means of both deranger and disturb (which are similar in French and English). Having studied the French symbolist poets with Wallace Fowlie (translator of Rimbaud and others) way back when, this immediately reminded me of Rimbaud's method for attaining poetical transcendence or visionary power through a "long, intimidating, immense and rational derangement of all the senses." (Rimbaud quote taken from Wikipedia). Which path leads to an anecdote you might like. Fowlie got a letter from Jim Morrison thanking him for his Rimbaud translations, but until he mentioned the name to a student, didn't know who he and The Doors were. May I just mention for those with lighter purses that Naxos started working through all the Liszt transcriptions in about 2004 -- I don't know if they've finished yet. The pianists are various, but I note that Konstanin Scherbakov's recording of Beethoven's 2 and 5 received very high ratings from the Penguin Guide, Klassik, Repetoire, and Classics Today. Other pianists in the series include Philip Thomson, Idil Biret, and -- an additional reason for my writing this -- Valerie Tryon. I recall Tryon's many recitals for BBC Radio in the 1950s and 60s, though she gave her first around 1945 (bearing in mind she was born in 1934). Chopin, Liszt and Rachmaninov always loomed large in those broadcasts. Over the years she's recorded for Pye (with Alfredo Campoli), Lyrita, Saga, Dorian, CBC (she now lives in Canada for half the year), Naxos, and recently for APR. And yet for all these years her profile has been singularly low, though the temptation to see her as the obvious successor to Moura Lympany among English pianists is hard to resist. Plaudits to Appian APR for taking her up this past decade. Bryce Morrison has written of the "immaculate virtues" of this "remarkable pianist" and she really deserves a wider public recognition. P.S. I meant to mention that Tryon's Pye LP with Campoli includes a performance of Liszt's Violin Sonata.